Darren Smith has revealed that taking control of Newtongrange Star will be his biggest challenge to date after he and Kenny Rafferty were appointed as co-managers this week. 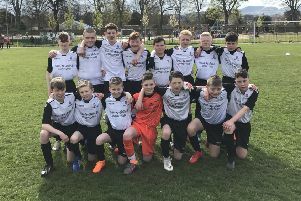 The New Victoria Park club have been performing well on the pitch in their first season in the East of Scotland League, but their off-field problems have been well documented in recent weeks. After the public fallout over former manager Stevie McLeish’s departure, with McLeish claiming his players went without pay and the future of the club was in doubt, followed by the incredibly short-lived stint in charge of his replacements Colin Affleck and Jamie Burrell, who both lasted less than five weeks in the hotseat – it’s been a testing couple of months for Star to say the least. Smith, who resigned from his post at Dalkeith Thistle on Saturday with co-boss Rafferty, sought reassurances over the club’s financial status in lengthy conversations with Star committee members prior to being appointed on Monday night. Despite admitting there will be considerable squad changes between now and next season given budget constraints, Smith is confident he and Rafferty can build a side which will be competitive in the top tier of the East of Scotland League next season. “It was something that just came out of the blue,” said Smith. “Dalkeith got an approach from Newtongrange and we [Smith and Rafferty] spoke to them. I know they were interested in other parties as well; we just had a chat with them, then we went back up for another chat which was basically an open conversation about everything. They came back to us and offered us the position on the back of that. “It was done late on Friday night, we were just waiting on them coming back to us. We weren’t not going to turn up to the game on Saturday, we’re not like that, we wanted to see the players and speak to them. It was an opportunity to explain the situation, speak to them and thank them for all their efforts; we felt that was the right thing to do. “It was nothing against Dalkeith, because everybody there from the players, committee, to everybody that worked around the club was great with us – it’s a great wee club. Smith, who revealed he spoke to McLeish, whom he played under at Musselburgh Athletic and latterly Newtongrange, continued: “The club needs a stability and it needs a structure in place financially where it is sustainable and the players are getting their wages. The expectation for myself and Raff is that we might have to build again because there is good players in there that with the budget we have been given, it might be unrealistic [to keep hold of them]. It’s going to be a big challenge but we are willing to take it on. “If we need to strip it back before we go forward, that’s what we’ll need to do. We’ll try to build for next year and make sure that we are competitive, like we have always done. Goalkeeper Kieron Renton, Dale Richardson and Wes Mitchell continued to take temporary charge of Star in their 2-0 victory over Hill of Beath on Tuesday night which saw them leapfrog the Fife club into third in Conference A. That result has handed Penicuik Athletic a huge advantage in the title race and they can go eight points clear of Beath tomorrow with victory at home to Oakley.